Over the summer I, along with several of my colleagues, were relocated from our tony Rockefeller Center digs in Midtown Manhattan down to Soho. All the girls squealed with delight because now they can visit shoe boutiques on their lunch hour, but I thought it was a downgrade. Midtown is where the action is, baby, and I miss it. The street meat in Soho is practically nonexistent. What I’ve found so far is drab and mushy. The company I’m consulting for has a few offices in the city, including one still in Rockefeller Center. I’ve become a bit of a mercenary. I am sometimes sent to a hot spot to help out with the workload. I’ve been back at Rockefeller Center for the past week and it feels like home to me. 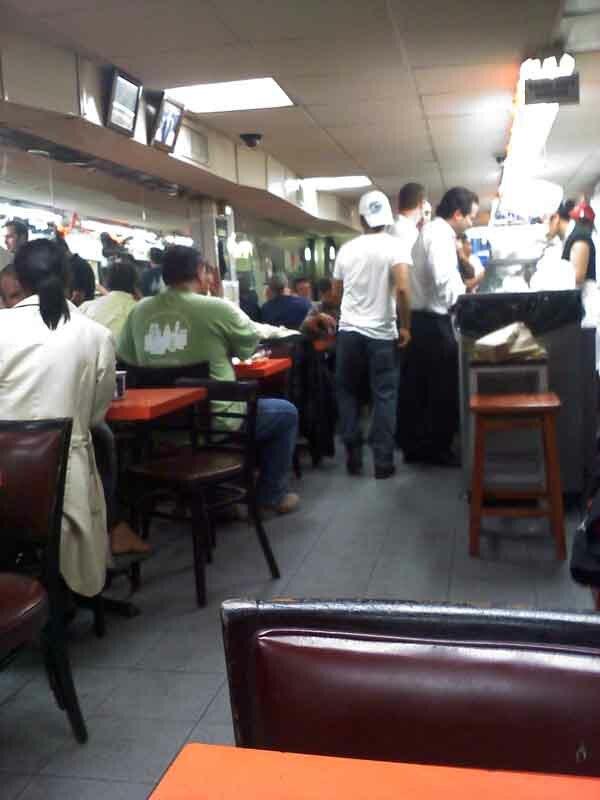 I celebrated my good fortune with a visit to Margon, a Cuban cafeteria-style joint on 46th Street. It’s tiny. If you’re not looking for it, you’ll pass by. The Cubanos are pretty popular but I’m not a fan. I go on Thursday or Friday for the ox tail. Is ox tail actually from an ox or is that just the name of it? Who the hell raises ox? And I’ve never heard of ox meat for dinner. Are they raised simply for their delicious tails and to pull carts? I’ve never seen an ox. Do they even have tails? God, they’re good. That’s a plate of black beans, rice and fried plantains on the side. 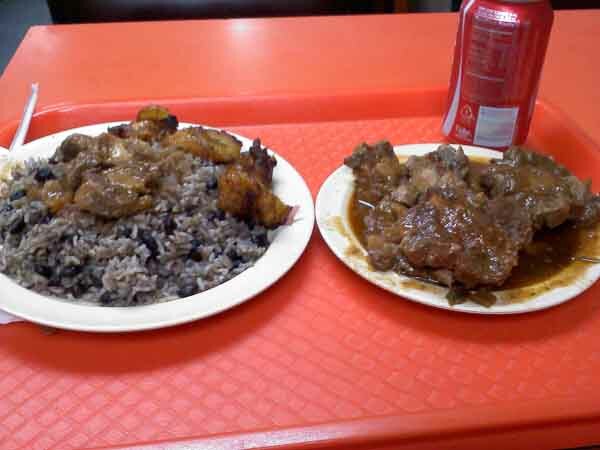 I glamor the girl behind the counter, so she always pours a little of the ox tail gravy on my rice and beans. It’s pretty narrow and cramped. The crowd is a mix of laborers and suits. During peak lunch hours, you may end up eating with a total stranger if there are no other seats available. If you don’t like having your personal space violated or if you’re squeamish about eating off of plastic plates and trays, you’re probably in the wrong city, anyway. The food is scrumptious and that’s enough to keep me coming back. 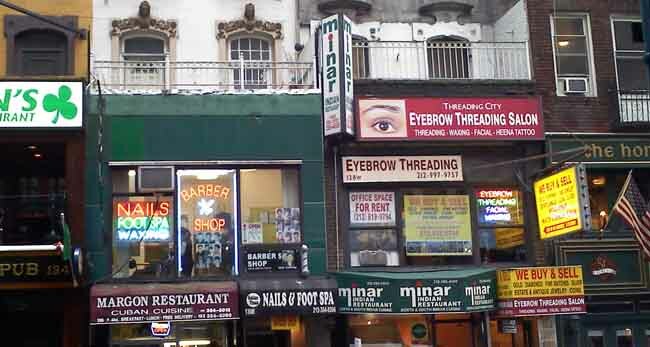 In this one small section of 46th Street, within steps of each other, you can get an Irish meal at O’Brian’s, a Cuban meal at Margon, and an Indian meal at Minar. You can get a haircut, your nails done, a waxing, and your eyebrows threaded. You can also sell your excess gold for cash. You can go to St. Andrews, a Scottish bar/restaurant with a large LARGE selection of scotch whiskey. It’s the only place in town where you can order haggis. Again, this is all within about 10 paces of each other. Multiply that times 1,000. That’s New York City. i can hear your arteries hardening through my computer speakers… the diner is perfect. ox tail nuggets? notsomuch! Looks like Southerners and Cuban eat a lot of the same thing – tripe and pigs feet and ox tail (which I’m pretty sure come from cows in the US). Where I grew up a lot of the little quickie marts would have a gallon jar of pickled pigs feet on the counter. I have never had any of it, because the thought of it sort makes my stomach turn, but I do wish I lived somewhere I could decide to walk ten feet in one direction for Indian food or ten feet in the other for Cuban. If I want Indian, I have to drive 45 minutes, and I’m not even sure there is a Cuban place in the Atlanta Metro Area. I’ve been to O’Brians, Minar and St. Andrews, but somehow I’ve missed the Cuban joint.Gotta rectify that soon. Daisy: Yeah, but what a way to go!Nutty: I’d demand the trip be rescheduled immediately or quit your job and head back to the UK. Priorities, dear.Cat: The problem with pigs feet is that they looks like pigs feet. Oxtail doesn’t look anything like an ox. Thank God. My mom use to tell me horror stories about being forced to eat tripe when she was a child, so that killed that meal for me.Savannah: When I was dating Mrs. Wife, she use to live right above and Indian restaurant on 4th Street in the East Village. Now, THAT was convenient on a rainy night!BEE: See what I mean! They’re RIGHT NEXT to one another and you can still miss it! It’s that small. I love little places like that, some of the best food to be found!Is it wrong that I know more about eye brow threading than I do about animals? Map: My mom use to eat all those things you mention. She use to call it “old world” food, and I suppose it is. She must have been sick of it because she never made it for us. Except for the oxtail. God, how I love oxtail.Cabby: Tripe is also very, very chewy. You forgot to mention that. Have you ever tried haggis? Yes, I know it’s not an Irish dish.EG: I can only imagine what brow threading is. It sounds incredibly painful. I’d rather have bushy brows. Yes, ox tail is a cow/bull tail. I know all of those dishes, but no longer eat (most of) them.What I don’t know, in my sheltered life, is eyebrow threading. What the beejeezlehooop is that? UB, an ox is just a bovine of some sort (usually a steer) trained to pull a cart. Types vary depending on where you live. So technically ‘oxtail’ is just the tail of some kind of cattle sliced up. They actually have relative long tails with a tassle of hair on the end for swatting flies.If they whack you with their tails, it hurts!Braised oxtail is sooooo yummy!!! I’m not so sure the Miami Cubans would think that’s Cuban food… I’ve been eating it my whole life and didn’t recognize a lot of that menu– though I’d kill for some Cuban food right now… and at least that RESEMBLED some Cuban menu items… nothing like that here in Sydney.Hmmm, I’m rambling, I think it’s the meds. I’m home sick with the flu– and now jonesing for cuban food. damn. I am so coming back there next July! Dinah: Threading is a method for pulling out your unwanted eyebrows. It looks painful to me but I’ve heard it’s not.Ponita: Thanks very much for the lesson! It sounds like you have major farm girl skills. I know you know your way around horses but I didn’t realize it extended to all farm animals.FGIS: First and foremost, I hope you get well fast. There’s a nasty strain of bug going around the city right now. The restaurant is run by Cubans, but I don’t doubt the food is more authentic down in Miami. For me, this will have to do for the time being.Nurse: Start making a to-do list. You might want to add the Abstract Expressionist exhibit that just opened at MoMA. A few years ago one of my friends asked why I was obsessed with New York. And I replied that it was because there’s food on every corner. You don’t ever have to cook. I also loved the fact that you didn’t need a driver’s license to get around. Sid: That’s actually an astute observation. I lived in the city for about 20 years and although I maintained my driver’s license, I never owned a car. Imagine that! 20 years without a car! On the rare occasions I needed one, I rented. I’ve always hated driving so I found it all very liberating. I know nothing about ox tail, AND my dad’s a butcher. But I know New York is a lot like London, what with the streets housing everything you can imagine in tiny little nooks and crannies. Particularly in Soho and east.